Robert LeRoy Parker was born on 5th April, 1866. His father, Max Parker, had a small farm in Circleville, Utah. 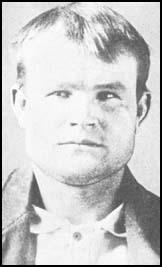 It was used as a hideout for outlaws and one of those who made regular visits was Mike Cassidy, who had a big influence on Robert Parker and he eventually adopted the name Butch Cassidy. Cassidy became a cowboy and helped drive cattle to Telluride, Colorado. He soon abandoned this job and on 24th June, 1889, Cassidy, Tom McCarty and Matt Warner, held up the San Miguel Valley Bank. Over the next few years Cassidy's gang robbed banks in Idaho. The gang eventually escaped to the Robbers' Roost in Utah. Cassidy now formed a new gang that became known as the Wild Bunch. This include Harry Longbaugh (the Sundance Kid), Ben Kilpatrick, Harvey Logan, William Carver, George Curry, Elza Lay, Bob Meeks and Harvey Logan. 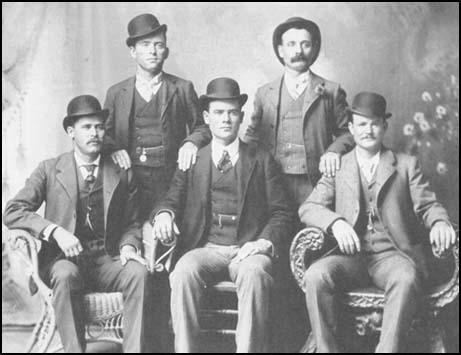 In 1900 Longbaugh met Butch Cassidy. He moved to the Robbers' Roost in Utah and joined what became known as the Wild Bunch. As well as Cassidy the gang included Ben Kilpatrick, Harvey Logan, William Carver, George Curry, Laura Bullion, Elza Lay and Bob Meeks. The name Wild Bunch was misleading as Cassidy always tried to avoid his gang hurting people during robberies. His gang were also ordered to shoot at the horses, rather than the riders, when being pursued by posses. Cassidy always proudly boasted that he had never killed a man. The name actually came from the boisterous way they spent their money after a successful robbery. On 2nd June, 1899, Cassidy, Curry, Logan and Lay took part in the highly successful Union Pacific train holdup at Wilcox, Wyoming. After stealing $30,000 the gang fled to New Mexico. On 29th August, 1900, Cassidy, with the Sundance Kid, Logan and two unidentified gang members, held up the Union Pacific train at Tipton, Wyoming. This was followed by a raid on the First National Bank of Winnemucca, Nevada (19th September, 1900) that netted $32,640. The following year the gang obtained $65,000 from the Great Northern train near Wagner, Montana. George Curry was killed by Sheriff Jesse Tyler on 17th April, 1900. The following year William Carver and Ben Kilpatrick were ambushed by Sheriff Elijah Briant and his deputies at Sonora, Texas. Carver died from his wounds three hours later. Kilpatrick escaped but he was captured in St Louis with another gang member, Laura Bullion, on 8th November, 1901. Kilpatrick was found guilty of robbery and was sentenced to 15 years in prison. Another gang member, Harvey Logan was captured on 15th December, 1901. Cassidy and the Sundance Kid began to think that being an outlaw in America was becoming too dangerous and decided to start a new life in South America. On 29th February, 1902, the two men and Etta Place, left New York City aboard the freighter, Soldier Prince. When they arrived in Argentina they purchased land at Chubut Province. After farming for nearly four years the men decided to return to crime and in March 1906 Butch Cassidy and the Sundance Kid robbed a bank of $20,000 in San Luis Province. During the raid a banker was killed. Other raids followed at Bahia Blanca (Argentina), Eucalyptus (Bolivia) and Rio Gallegos (Argentina). In 1909 the men were back in Bolivia. One account claims that Butch Cassidy and the Sundance Kid were killed in a shoot-out at San Vicente. However, the police were not able to positively identify the two dead men. According to another source the men were killed while trying to rob a bank in Mercedes, Uruguay in December, 1911. (1) Robert Lawson was a mail clerk working on the Union Pacific Railroad. In the early summer of 1899, he was in the mail car of a train stopped by the Sundance Kid Gang in the wilds of Wyoming. Lawson was interviewed about his experiences and it appeared in the Buffalo Bulletin on 8th June, 1899. As soon as we came to a standstill, Conductor Storey went forward to see what was the matter and saw several men with guns, one of whom shouted that they were going to blow up the train with dynamite. The conductor understood the situation at once and, before meeting the bandits turned and started back to warn the second section. The robbers mounted the engine and at the point of their guns forced the engineer and fireman to dismount, after beating the engineer over the head with their guns, claiming that he didn't move fast enough, and marched them back over to our car.